Aux Radiator Fan for 2002-2006 R50 MINI Cooper, R53 Cooper S and 2005-2008 R52 MINI Cabrio S. If your Radiator fan is not working this is most likely the problem. 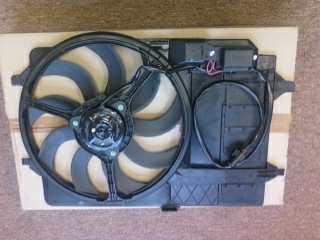 Over the years we've seen many of these fans failed causing your MINI to overheat. Also when these fans fail 1/2 way the A/C in your car won't work when the MINI is stopped. This is an Original MINI part not a cheapo aftermarket version of the aux fan. WMW does NOT install or recommend the aftermarket fans as we've had many comebacks and failures with the aftermarket fans. Save yourself time and money by doing it once. Please put your MINI VIN number in the notes box when ordering to insure we send you the right fan as there are 3 different models of this fan.